This article is about the 10 most popular local dishes and traditional foods in Warri as a tourist or a guest to the Delta State at large. Warri is the main business hub of Delta State with Asaba as its capital. The things you can’t find in Warri, you certainly may not them in Asaba. Like the popular saying “food is the best way to get to man’s heart”. I promise you that you won’t be disappointed with these tasty food delicacies that we have highlighted in this article of the top 10 most popular local dishes and traditional foods in Warri. Warri city is no man’s land because as the main business hub of Delta State so like a magnet it has attracted people from all the ethnic groups in Nigeria to do business or work in different government and private parastatals in Warri. The different foods that are highlighted in this article are the 10 most popular foods that are eaten and prepared in the best restaurants and eateries in Warri, Hotels, bush bar and local food vendor (bukka or mama put). These top 10 most popular local dishes and traditional foods in Warri forms the major foods that should be prepared in any traditional marriage ceremony of anyone that is of Delta origin. The major occupants in the Warri City are Urhobos, Isokos, Ijaws, Itsekiri, Okpe the Aniomas (kwale, Agbor, Abe, Asaba, etc). The local dishes and traditional foods have been compiled from the various ethnic groups that are mentioned in this article. Banga soup and starch is one of the top 10 most popular local dishes and traditional foods in Warri that you definitely should eat because words alone cannot describe how tasty and spicy Banga soup and starch really is. Banga soup is prepared from fresh palm nut fruits. 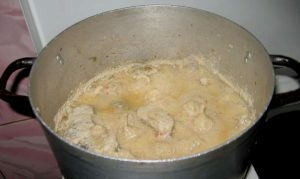 The oil and water extracted from the boiled palm nut fruits are used in preparing the soup. You can use fresh fish, Dried Fish, Bushmeat, or Cow meat. But dried fish is mostly preferred for traditional or cultural events. In Ughelli of Delta State, there are joints where Banga soup is the centre of attraction. You will definitely be satisfied that you have eaten this very tasty and spicy food that leaves you wanting for more after you are full. 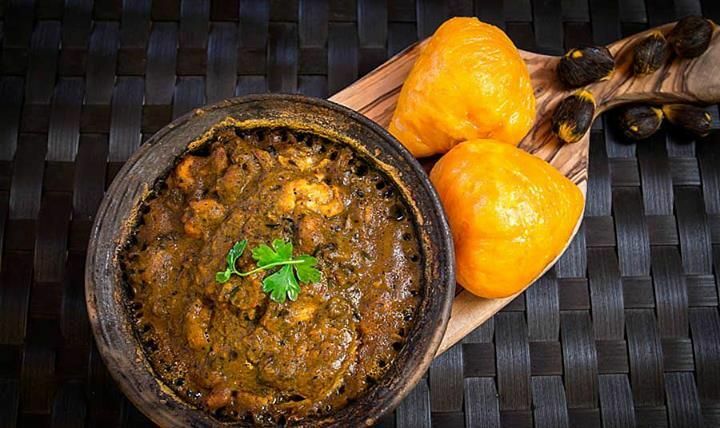 Definitely Banga soup and starch tops our list of the 10 most popular local dishes and traditional foods in Warri and Delta State at large. Owo Soup and Starch is actually the most important of the 10 most popular local dishes and Traditional foods in Warri because it is always prepared during traditional marriages. Isokos, Urhobos, Okpes’, etc all demand it and must be examined before it is served in any traditional marriage. Preparing Owho soup and starch requires a lot of experience and skill. Most young ladies do not know how to make this soup. But as they get older they learn how to because a true Warri born must demand it from his wife. 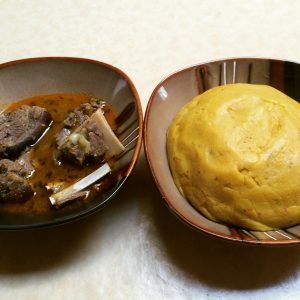 Ogwo soup and starch is one of the most passionate food eaten in Traditional settings and this is why it is on our list of the 10 most popular local dishes and traditional foods in Warri and Delta State. You really need to use Dried Fish, dried or smoked bush meat, or dried or smoked cow meat. But dried fish is mostly preferred for traditional marriages. The quality and importance of the food easily make it one of the top 10 most popular local dishes and traditional foods in Warri. Boiled yam and black plantain also can be used to eat the Owo soup. When dem nor share Owo Soup and Starch for party, then you go see better quarrel between elders, young and the children. Nor try am say you nor provide owo soup and starch the marriage sef nor go hold. 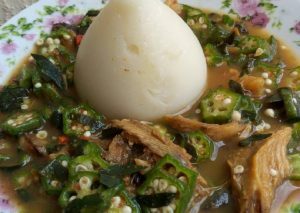 Egusi Pepper soup and starch makes a cut in the ten most popular local dishes and traditional foods in Warri and Delta State because of the unique taste and skills required to prepare the soup. Like the other types of soup mentioned above, egusi pepper soup is not prepared like the convectional egusi or melon soup that is prepared everywhere in Nigeria. Even though the main ingredient is melon the preparation is very different because of the addition of traditional spices which are used when cooking the egusi pepper soup. Egusi pepper soup is much tastier when prepared with goat meat and best enjoyed with starch. So, when visiting Warri or any part in Delta State, please endeavour to taste this flavoured soup which is prepared with goat meat and best enjoyed with starch. Visiting Delta State, Warri precisely, please order for this delicious delicacy in any of the top restaurants, hotels and bukka or mama put because these delicacies may not be found in the top restaurants or hotels unless ypu make special order or request because of the unique skill it requires to prepare the soup. Okro pepper soup makes the cut in our top 10 most popular local dishes and traditional food in Warri and delta state because of the quality and skills required to prepare the Igbagba-ofofo soup. 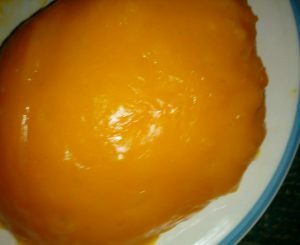 It is one unique food that every mature man, elders in the will enjoy because it is medicinal and a very healthy food to eat which is void of cholesterol and fats. So grab a plate or request for this food when you are in Warri and definitely you will long for more plates of soup if you are man enough to go for more. This is the type of food you eat during cold and rainy weather. Instantly you become warm and all sweaty. so not miss out in the action and enjoy of the soup which is one of the top 10 most popular local dishes and traditional foods in Warri. It best enjoyed with starch, or eba or even akpu depending on you. The name Iribotor means soup made on the ground. Here ground means soup made on the mortar and pestle or food that wasn’t heated with fire. This is one of the quickest meal ever to be prepared in Warri and Delta state at large especially by Isokos, Urhobos, etc. It made our list of the top ten most popular local dishes and traditional foods in Warri and Delta state. Iribotor is best enjoyed with boiled yam and black plantain. Iribotor soup is made with roasted fish, some may decide to add red palm oil others may not. When palm oil is added to Iribotor it is Ogbuvie by the Isokos. Iribotor is fast and active because the choice of spices used are natural and medicinal. The spices in the soup are used in the treatment of fever, headaches, and best enjoyed by newly delivered women. You definitely need to try out the Iribotor soup because it is one of the quickest soup to make. This is definitely one of the top 10 most popular local dishes and traditional foods in Warri. Goat meat pepper soup is very spicy and tasty soup and it is one of the top 10 most popular local dishes and traditional foods in Warri which is served in traditional events and festivals. You just can’t beat goat meat pepper soup. Goat meat pepper soup is just the ultimate because of the cultural attachment of goat meat and how tasty it is when used in preparing the pepper soup. You can prepare pepper soup with fresh fish, dried fish, cow meat or chicken pepper soup but the traditionally recognized pepper soup must be goat meat. 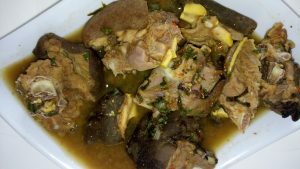 Goat meat pepper soup makes the cut in our list of the 10 most popular local dishes and traditional foods in Warri and Delta state. The pepper soup is best enjoyed with boiled yam and plantain. Plantain is one food that is respected by every true Warri born. Elders do not joke with it, women as well and even youths because of its nutritional value and tradition role it plays in Delta State. This is the traditional food prepared for traditional settings amongst the Ijaw people. 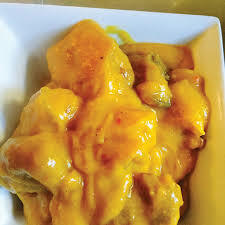 This delicacy is a must for all traditional weddings for the Ijaws and kalabari people of the south-south of Nigeria. It quite an important food for the Ijaw speaking people which is why it is on our list of the top 10 most popular local dishes and traditional foods in Warri. This is a special food which is unique to the Ijaw people. 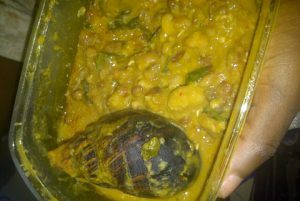 The food is basically prepared with boiled unripe plantain and snail but you can add beans to it as well. Keke Fieye is prepared just like porridge and it is eaten in Bayelsa, Rivers and Delta States. 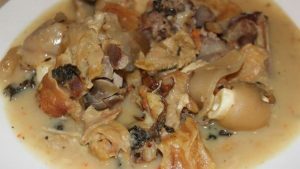 So if you have tried this delicacy then you are missing out on the top 10 most popular local dishes and traditional foods in Warri. It is quite popular amongst the Ijaw Speaking ethnic group. This is a unique soup prepared by the Anioma people of Delta State. The Aniomas are kwale, Asaba and Agbor people because of the language they speak. Nsala soup can be eaten as breakfast, Lunch, and Dinner. Nasala soup is best enjoyed when prepared with goat meat but you can use beef, bush meat or fish. The Nsala soup is best enjoyed with Fufu, Eba, boiled yam or black unripe matured plantain. 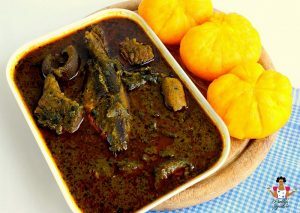 The Nsala soup makes the list of the 10 most popular local dishes and traditional foods in Warri and Delta State. Banga rice is best enjoyed for many persons when it is steamily hot and for some others cold. but however you want it, Banga rice is always one of the top 10 most popular local dishes and traditional foods in Warri you will always get to buy in most food vendors. Hot Banga rice is one of the most sort after foods in Warri. Hawkers of Banga rice are always making money because where you hear these hawkers cry out “ buy hot Banga rice” people from everywhere just want a taste of it. Banga rice is made from water and oil that is extracted from palm nuts and rice. You can decide to prepare it anyhow you deem fit. Banga rice is prepared soft and watering not like the conventional Jollof rice. It is always in high demands and one of the most cooked delicacies in most ceremonies or events. 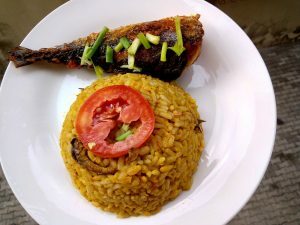 Banga rice makes the out list of the top 10 most popular local dishes and traditional food in Warri and Delta State. The list above of the top 10 most popular local dishes and traditional foods in Warri and Delta state has one thing in common. They are all spicy foods and highly important for different cultural and traditional events. The different foods are all medicinal because of the nutrients and items needed to prepare the food. So if you ever come to Warri or Delta State, please ensure you try the different soup and I bet you that you will always come back for more plates. There are other foods that are enjoyed in Warri but for the sake of this article, we will stick with these top 10 local dishes and traditional foods in Warri and Delta State at large. Starch is one of the traditional food that is widely eaten in by Deltans. Starch forms the core traditional and cultural swallow amongst the Isokos’, Urhobos’. Okpes’ Itsekiris’ etc in Delta State. 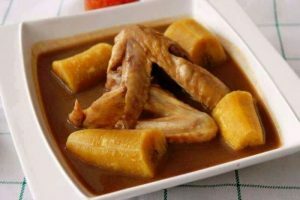 Because of the importance of starch, it has become one of the food parents ensure that their female children get to make because most men from these ethnic groups mentioned above enjoy eating starch with virtually all the traditional soups mention in the top 10 most popular local dishes in Warri and Delta State at large. So, please ensure that your children learn to prepare any of these foods that have highlighted in this article above if you are a true Deltan or Warri born.